Hey, it’s been way too long since I’ve done a Spiral Galaxy Monday, so here’s a good one. My love for big splashy spiral galaxies is well documented, but sometimes I also love one when it gets a bit edgy. This Hubble image is pretty amazing: you can see individual stars in the galaxy, even though it’s 55 million light years away! That’s 550 quintillion kilometers, in case you’re wondering. And astronomers consider that to be close by as galaxies go. This unusual image is a combination of visible light from the galaxy plus light in the near-infrared, just outside what the human eye can detect. You can see bluer regions where stars are busy being born, the more massive and hotter newborns lighting up their surrounding gas. You can also see long clouds of dust - complex chains of organic molecules - which are opaque to visible light, so they block the starlight behind them. This galaxy is somewhat similar to our own. 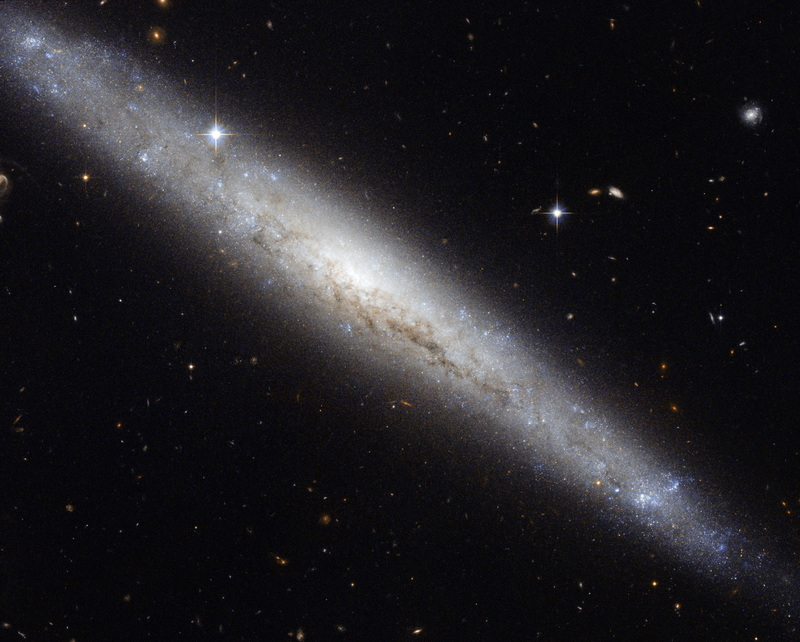 It’s a bit smaller, 80,000 or so light years across, but like ours it’s an open spiral (which, even though it’s edge-on, can be determined in a number of ways, including radio observations which trace the arms of the galaxy). The observations making up the image were taken as part of a project using Hubble to characterize nearby edge-on spirals, and the image itself was put together by Luca Limatola as part of the Hubble’s Hidden Treasures project - encouraging people to find overlooked Hubble observations and create beautiful images from them. - Hubble’s Hidden Treasures: winners!